Faced with a printed needlepoint canvas you may think immediately of tent stitch. 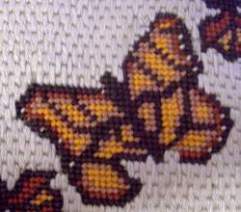 Small, neat stitches that are ideal for filling in a pictorial design such as the butterflies on the cushion (left). But did you know there are three ways to work tent stitch? Read on to find out how to do needlepoint using this basic technique. They all look the same on the front of the work, but give very different reverse sides. Which you choose can be dependent on the canvas you are using, and the purpose of the finished piece. Of course this is only one of the many needlepoint stitches, you can add texture and interest to a design by using a variety. This is, as it sounds, just the first leg of a cross stitch. To work it follow the guide I gave for cross stitch, without making the return journey. This is probably the easiest method of working, but it does tend to distort the canvas whilst stitching is in progress. 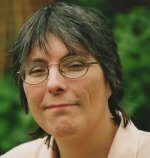 You may end up with a twisted or skewed project rather than a nice straight piece of work. As there is little thread on the back of the canvas using this stitch does not make for a very hardwearing finished item. Working the tent stitch in this manner creates a nice padded reverse side, but it does use more thread than half cross stitch - something to keep in mind if you are working a kit, as you may find you run out of yarn if the quantities were calculated on half cross stitch. Start the top row by following the numbering on the diagram. Each stitch is worked in a downwards diagonal direction over 1 canvas thread (or two if you are using Penelope canvas). Take the needle back up to 3 to start the second, leaving a longer diagonal stitch on the back (as shown by my darker blue lines on the diagram). 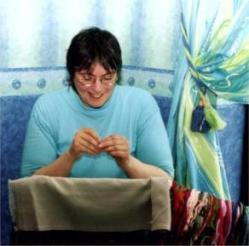 When you reach the end of the row, you need to start each stitch at the bottom and head upwards as shown by the arrows. You will get one vertical stitch on the back where you change direction. Continue in this manner to complete the second row. 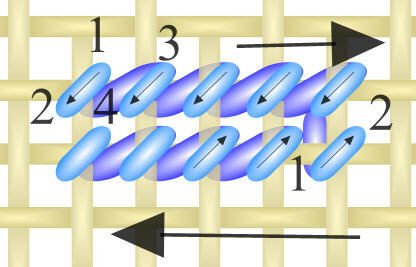 The neatest method of working tent stitch is with the basketweave stitch. This time you are working in diagonal rows. Start with the blue lines on the diagram. Each stitch is heading upwards but the actual row is going down the fabric. You will get an almost vertical stitch on the reverse. As with the method above this way of working does use a little more yarn, and a little extra concentration is also needed. I have shown the second row in pink. You start with stitch a-b and this time both the stitches and the row are going upwards. The stitches on the back will be almost horizontal. This variation gets its name from the basketweave appearance it forms on the back after a few rows. In fact you can easily tell if you have made a mistake by tell tale stitches going in the wrong direction and spoiling the "weave". It takes a bit more practice but basketweave doesn't tend to pull the canvas out of shape, making it ideal for large areas of background. For smaller areas, with lots of colour changes, it may be easier to use the continental version. 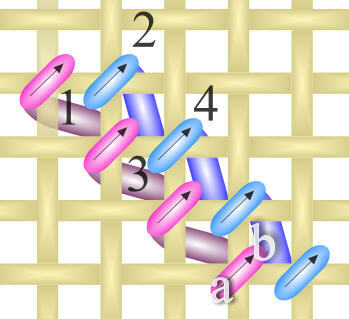 I hope this helps you decide which form of tent stitch to use for your next needlepoint project.